A trained dancer for 16 years, I was forced to give up my passion (and the only exercise I enjoyed) when I began working full time in January 2010. By the end of last year I was 10kg heavier, grossly unfit, depressed at the thought of shopping for clothes and tired ALL the time. It was time to get serious about my health. 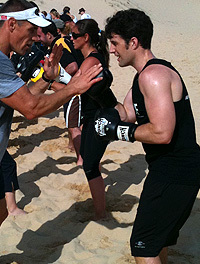 I called Sean and together with nutritionist Lauren Deacon we embarked on a strict weight-loss and fitness program. I couldn’t believe how quickly the weight began to fall off. In four short months I had reached my immediate goal of losing 10kg, and I haven’t looked back. I have since shed 12kg and lost almost two dress sizes, I have oodles more energy, and I love what I see when I look in the mirror. More importantly, healthy living and exercise has become a huge part of my life. Real Results Fitness has kept me on track and helped me to love other forms of exercise than dancing. I was always one of those people who said that I can’t run, but a few weeks ago I completed 5km in just over 35 minutes – a personal best for me. I’m evidence that with strong will and great support from the team at Real Results Fitness, losing weight is simple. The last eight months of good health and fitness, have been a very personal journey for me. Prior to this, I had accumulated over 12 kilos in weight over eight years and was chronically affected by digestive issues. I was generally unfit, particularly for my two young kids. Although I am still getting over my digestive issues, I am in better health and fitness at 44 years of age and feel I have a fresh and positive outlook. Every class is still a personal challenge and yet an achievement and I hope to complete me my first-half marathon. 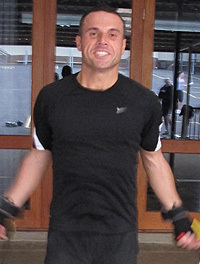 I love the classes at Real Results Fitness Oatley because they're fun and friendly as well as challenging. I have so much more energy and it's a great stress relief and pick-me-up. When I miss a session I'm itching to get back out there again and burn off some energy! 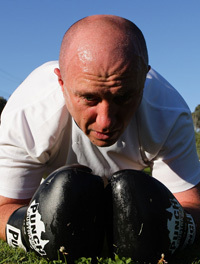 My favourites are running with the 5kg vest as well as lunging and boxing. A bonus at Real Results is the trainers are all friendly (not to mention good looking!) 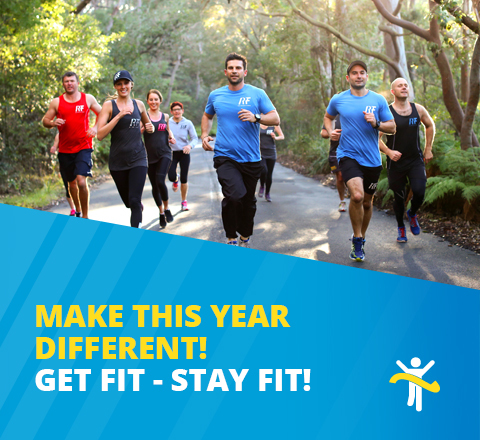 and each has a different style; Phil loves his lunges and squats, Sean loves circuits and abs, Jason loves boxing and core work, and Nathan is the sprinting and running king – and they are all very good at encouraging everybody. Jarrad has been a client of Real Results Fitness since its inception in 2009 and completed his first half marathon in that year. One of Jarrad's reasons for joining the Real Results Fitness team was to meet new people as he had moved up from Melbourne and got inspired by all the happy people he saw in the park. He also says that training makes him get more out of the working week and the boxing is a great stress relief from the hectic Sydney life. His current goals are to get ready for the beach for the summer and to learn how to surf. Best of luck J-dog!! 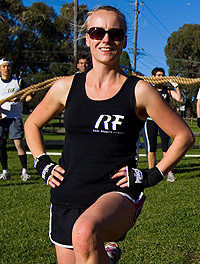 Marieke joined Real Results Fitness in January 2010 to help get herself back in shape after having two kids. She sees the classes as an important start to the weekend and loves the culture and camaraderie she has found in Saturday's class. Marieke is looking forward to entering a short running event at the end of this year and is busy getting fit to go to Europe with the family. I have been training with Real Results Fitness for the last two years. In that time I have really enjoyed the outdoor format for training. The exercises drive me really hard and my level of fitness has increased dramatically. 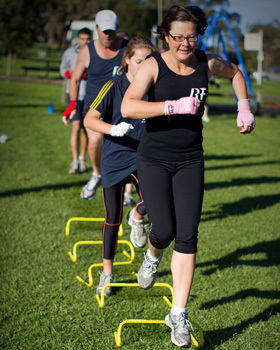 Training in a group helps to motivate me and I know that rain hail or shine I need to drag myself out of bed to train. The classes are challenging and also fun. There is great mix of people in the class which makes more interesting to attend.